Photographs of abandoned house tend to make us feel melancholy. They make us wonder who lived there, what happened to the people that lived there, where and why did they go? A new book, Pieces of String, from photographer Justin Kimball makes us feel those sorrowful feelings. Kimball accompanied his brother Doug, an auctioneer to these abandoned places. While his brother collected items for auction Justin photographed what was left, from the abandoned rooms to the smallest things such as stains, string, or a hand written note. Kimball gives us 60 photographs that provide emotional impact of what is left from other people’s lives before they are tossed and never seen again. He also provides an essay that provides another emotional impact during a time of foreclosure and abandoned homes. 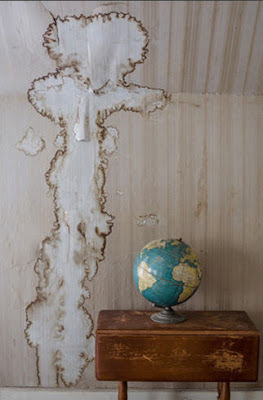 Simple items such as a cross hanging on a door, a child’s desk, two wigs in a bathroom provide a glimpse into the lives of the people who once lived there, again making us wonder where did they go?